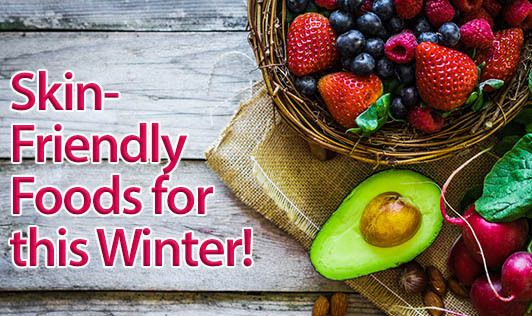 Skin-Friendly Foods for this Winter! Do you experience dry flaky skin and scalp? Are you tired of using the lip balms to cover those chapped lips? Cracked heels are also not far now. If you are scared of dry skin in winter that can add extra lines on your face, then welcome this winter with the below mentioned foods that can take care of your skin, scalp, lips and heels. • It's free! Water is one of the best things that can do a lot good to your dry skin. It hydrates your skin, reduces the wrinkles, improves blood circulation, removes toxins and also adds glow to your skin. • Selenium, a trace mineral helps in protecting the skin damage by free radicals. Include your favorite fish or button mushrooms. Chapathi made of whole wheat flour is also good enough! • Antioxidants do wonder here as well. It fights dry skin and wrinkles. Add plenty of fresh fruits and vegetables like berries, tomatoes, guava, oranges, spinach etc. to help your skin fight dryness. • We have been studying this since our school days that vitamin A is especially good for our skin and eyes. Then why not munch on oranges, carrots, egg yolk! Even a til (sesame) laddu can steer clear your dry flaky skin. • Vitamin C, rich in antioxidants also offers sun protection. Time to include those exotic kiwi, broccoli and Brussels sprouts along with your favorite citrus fruits. • The anti-inflammatory and immunity enhancer- vitamin E present in nuts (almonds, walnuts etc), olives and vegetable oils can give good nourishment to your skin, scalp and lips. • Dairy products including whole milk, ghee can also give that glow to your dry skin. • Green tea, present in a few of your cosmetics helps to keep your skin supple. Then, why not drink a cup of it every day to stop inflammation, slow DNA damage and prevent the sun from burning your skin.